I had a cage that was in good condition and had lasted through several small pets. When my rat died of old age, I decided to adopt from the local animal shelter. Here is Ben, he is neutered and he was found in a box in the parking lot. Rabbits love to look in mirrors. A flexible dog enclosure lets him have outside time (supervised). Lots of pets need homes because of the hard economic times. 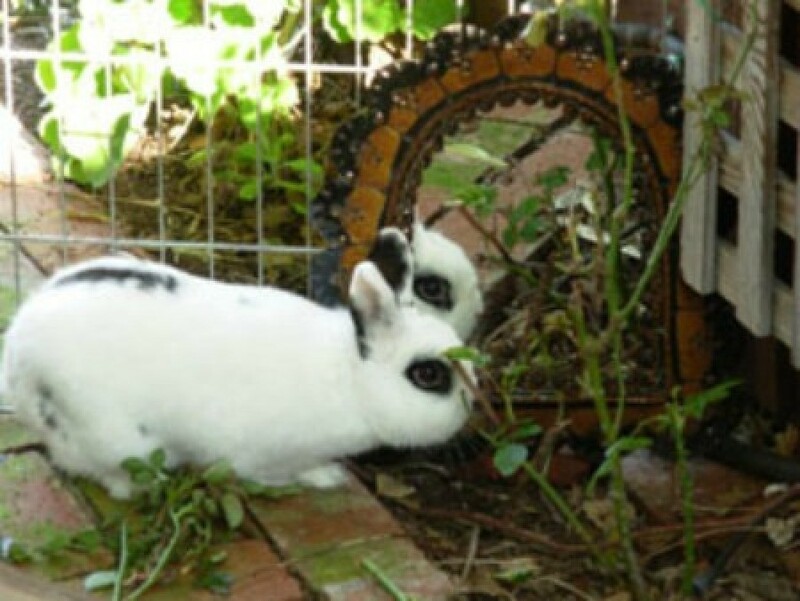 Did not know that rabbits enjoyed mirrors. Thanks for the info. Will get one for my "Crusier"
I'm going to buy a mirror for Sparkle. I didn't know they liked them. My fish has a mirror and my bird has a mirror. Now my rabbit will have one. The only ones left are the dogs, and I think they will pass on the mirror, they have each other...(4)Thanks! I know they like bird toys to ring and play with but I never thought of a mirror. How sweet!